Regularly, one of the members of The Building Hero Project, our community design leadership program in Philadelphia, will be reflecting upon and sharing their experiences in the program. 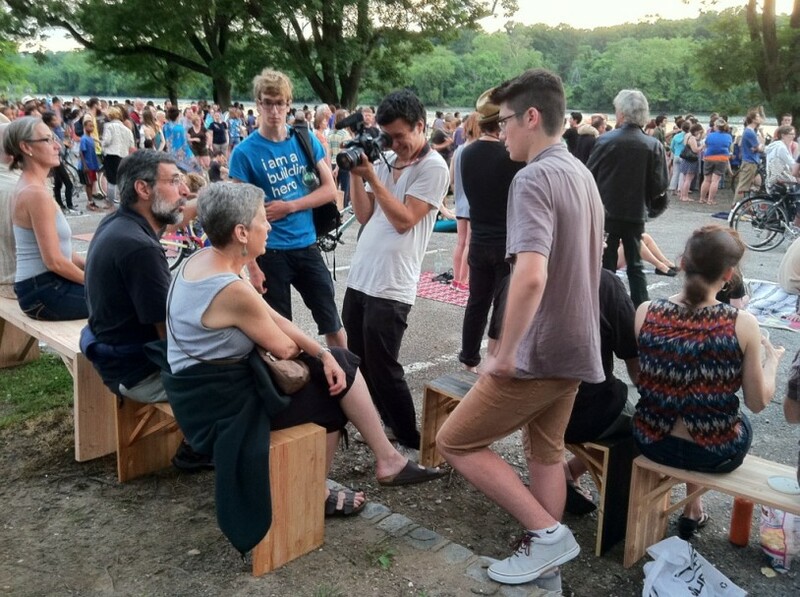 This week, Meghan Talarowski, who just graduated from the University of Pennsylvania writes about the bench-bombing the team has been doing in Philly to get feedback on their benches, gather footage for their Kickstarter video, and build awareness for their micro-business. The moment we stepped into Rittenhouse Square, we heard the music. We followed it to the corner of the park and saw a band playing for a local swing/lindy hop group offering free dance lessons. What was interesting though, was that while all of the benches around the band were full of people, there was about a ten-foot gap between the sitters and the dancers. The gap was just enough to discourage people from joining in the fun, and the dance group was more of a spectacle than an interactive experience. Enter the “bench bombing”. We took advantage of the gap and put our benches down in an arc facing the dancers. In just a few minutes, people filled up all five benches. Feet started tapping, children began dancing and all of a sudden, the audience became part of the show. Since the sitters were closer to the action, the dancers could grab them and encourage them to dance too. It was amazing to watch, like a social experiment. Those on our benches were more engaged, danced more and smiled more. With one small act, we brought people together in a way that the permanent park design could not. As a designer of public space, this was a pretty eye opening experience. William H. Whyte, a famous urbanist and public space advocate once observed that “people like to sit where there are places for them to sit”. We proved, in one hour, how transformative a few places to sit could be. 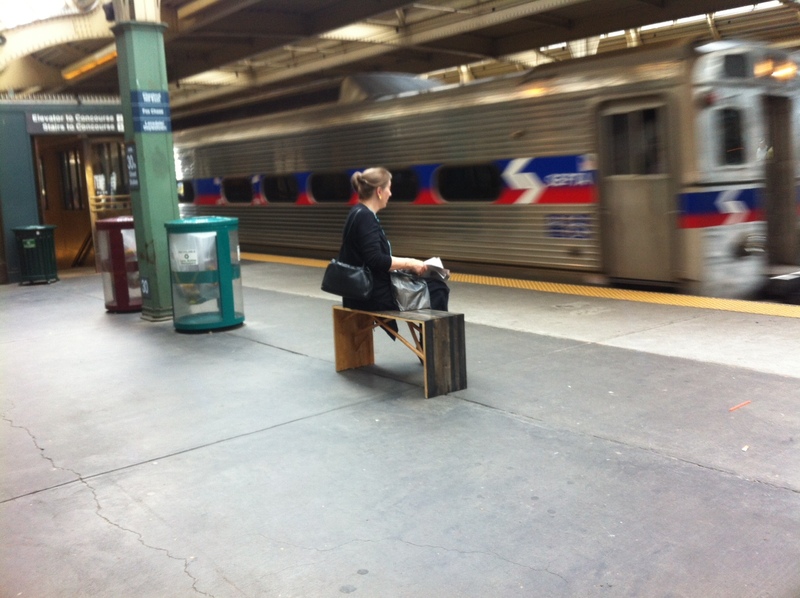 Now we have to keep our momentum going and bring benches to even more public places around Philly. We need to start a movement of sitting, of conversation and of hanging out. We really can bring people together, and it starts with something as simple as a bench. I love this idea and think it really has great potential for bringing people together to dance, sing, communicate as they never have before. Just today I heard that the United States is one of the happiest countries in the world! This could make us even happier! With connectedness, comraderier, love for what is happening ……it really would be healing. I would encourage people to make benches and take them wherever ever they go. Plunk them down and see what happens! As winter approaches in Maine, I foresee putting benches beside outdoor ice rinks in the town mall; benches in malls that are having events, on and on it can go. We all need to be creative to bring people together. Are there plans for building benches inexpenseively? Perhaps, local high schools or vocational schools would take this on as a community project! I love this project. We’ve been wanting to get moveable seating in a public place in our town, but the City says the maintenance costs will be too high. Please, where can I find more about how you got the benches built, and how you (or the city) plans to handle the maintenance including keeping people from stealing the benches?